A 'War Story' With Big Ambitions And Mixed Results The drama War Story is trying to wrap itself around both a personal story of a traumatized journalist and some larger social issues. Despite a strong central performance, it succeeds only partially. 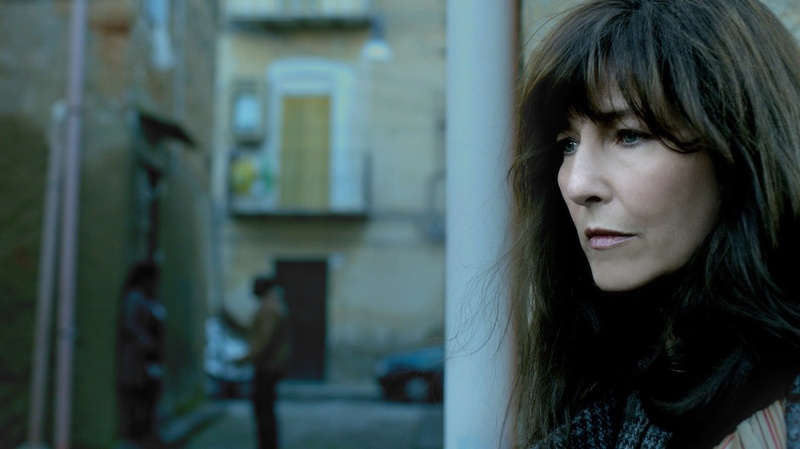 Catherine Keener plays a traumatized journalist in War Story. "You're an amazing woman who has decided to go into war zones and take pictures. You're a bit crazy to want to do that, and I think now you're too crazy to stop." That's what Albert (Ben Kingsley) tells photojournalist Lee (Catherine Keener) in War Story, and much of the same has been said about real-life war correspondents from Martha Gellhorn to Marie Colvin to Chris Hedges, who in an interview acknowledged that he sometimes gets urges "to live at that kind of pace again. ... But in the end it's a very unhealthy way to live." With War Story, director and co-writer Mark Jackson spotlights none of the adrenaline of Lee's job but much of the resulting trauma. The movie begins soon after Lee has returned from covering the conflict in Libya, where her reporting partner Mark was violently killed in front of her. In shock, she retreats to Sicily, to a town and hotel she has visited recently, where she asks for the same room she stayed in before and hunkers down, blinds lowered, the world frantically kept at bay. Jackson sticks close to Lee throughout the film, at times even stubbornly refusing to cut away from her in dialogue scenes. This is, at heart, a film trying to get us into Lee's head, particularly in the first 15 minutes, which largely consist of her roaming the streets of Sicily, taking pictures and convincing doctors to prescribe her painkillers for a potentially broken rib that she refuses to check on with an X-ray. The story expands slightly when Lee encounters Hafsia (Hafsia Herzi), a Tunisian migrant attempting to ultimately settle in France. Lee, believing at first that Hafsia is a girl she photographed in Libya, decides to help her not only in securing passage across Europe but also in the more short-term project of getting an abortion that Italian doctors refuse to provide. The topical and politically charged subplot conflicts with the film's otherwise tightly focused psychological profile of Lee. Good intentions notwithstanding, Hafsia is in part a distraction for Lee, a woman she can help in lieu of helping herself. But Hafsia also represents the migrant crisis in Italy, in which hundreds of people have died trying to make it from North Africa to Europe by boat. Jackson is not so blind or callous as to ignore this: We hear Hafsia's description of her perilous voyage across the Mediterranean and, in a hotel manager's warning to Lee not to bring "undesirable guests" to his establishment, we witness the kind of treatment they face once they arrive. But Jackson isn't able to do justice to Hafsia's story while also portraying Lee's frail psyche. That's in part because he accomplishes the latter by sticking so close to Lee, focusing largely on her perspective and shooting her primarily in close-up, a style that makes it difficult to get beyond her immediate reality. And that's precisely what's missing from Hafsia's story: a sense that she belongs to a wider problem, that she's not merely a sketched-out representative of a widespread injustice. It's not just her. Any time War Story's plot pushes beyond Lee, it exhibits a troubling superficiality. Kingsley is wasted as Albert, a former reporter who worked with Lee and seemingly exists in the film only to state the coldhearted (and exaggerated) newsman's idea that death is but part of war reporting and Lee must pick herself up and continue searching after the story. Such missteps might have done the film in completely were it not for Keener's controlled performance. The film doesn't offer much explicit context for Lee's plight either — we get little information about her relationship to Mark, few details about her work or the ingrained dangers of war reporting. But all of that is slowly implied through the deterioration of Lee's mental state. In Keener's hands, the collapse feels urgent but not unhinged, and Lee's trajectory from steely and determined to openly distraught lends an otherwise meandering film a strong core. That alone doesn't entirely outweigh War Story's other undeveloped elements, but it does keep you invested in a film that otherwise never fulfills its larger ambitions.